Well this is my Supershot and my brother in laws hot shot we purchased the kits and both built them at the same time. That Hotshot is exactly the same color as mine. Well It's a great color for this buggy! I have the original supershot with that Green color . Very nice color that green . Green is good guys and I dig the blue Hotshot too. 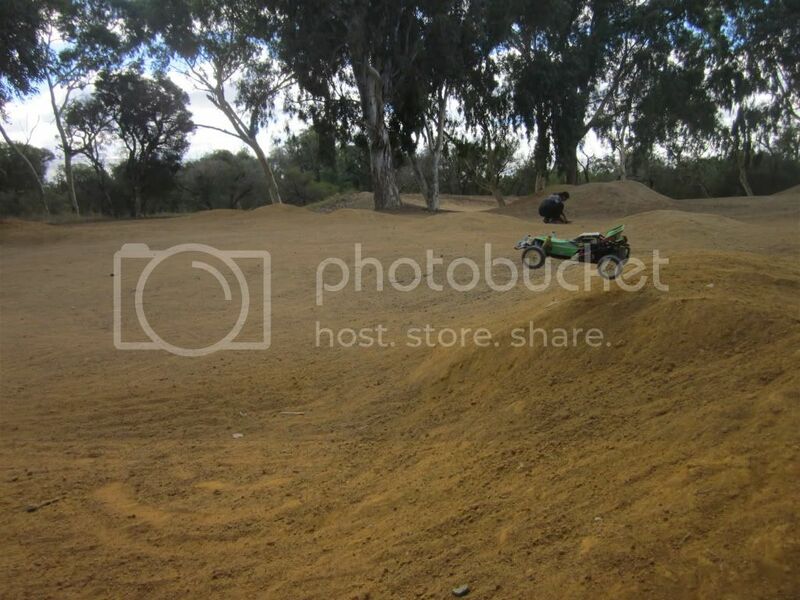 Thommo nice shot that place looks awesome to ride rc's!! 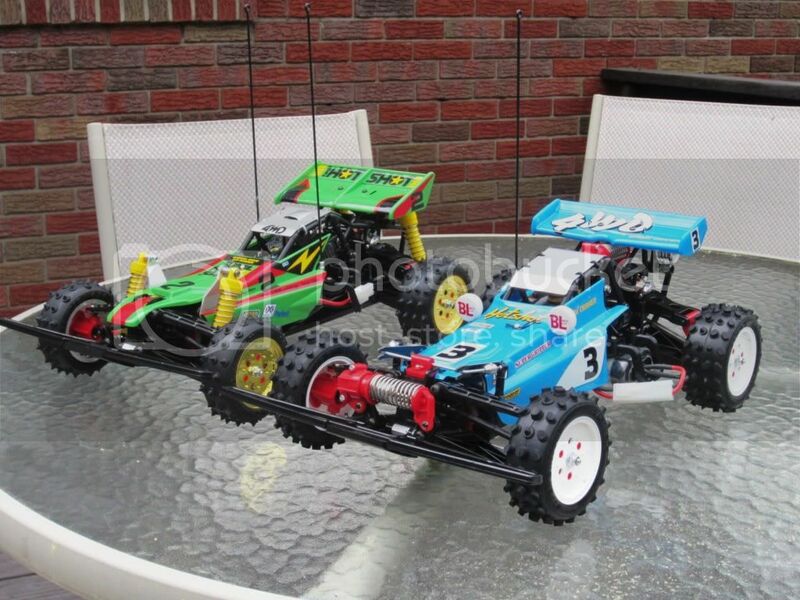 are you running the stock tamiya oil in the shocks? Hey Shen, that actually is matman's original Supershot so he is the man re your shock oil question. I have to agree, what a fantastic place to run them. So how much faster is the Supershot compared to the Hotshot in a drag race? Assuming you've had a little head to head? Well have to drag race em and see. Shen -- I've always been a big fan of the box art red on the Hot Shot, but that blue looks fantastic. Great job on both builds. alright shen nice looking brace of shot,s you and your bro have. im really interested in the up coming drag race between them as i was thinking of buying a GT tuned for my hotshot. have you both used the same size pinion gear? if there is not much top end and acceleration difference between them i might go for a superstock BZ instead. bring on the drag race. Forgot to ask, did you use any 'hop up parts' on your Super Shot? If you did, could you please tell me what are the parts? steponit no hop ups other than a robinson racing 15 tooth steel pinion gear . FLEXUS we both have the same 15 tooth pinion gear. If you want cheap speed don't wast your $ on a tamiya motor for like $10.00 get the 19 turn that comes with the evader beetle or the 20 turn that comes with the evader ext2 i have the 20 turn photon speed 2 in my tamiyas it's fast for the $ it can't be beat!!... the new DT beetles 19turn just came out recently so i never got one but i would have if they where out when i got my 20 turn motors!! O they are made by duratrax. I did put 25wt silicone shock oil in the shocks also and took the bottom nuts off the front shock shafts at the bottom so the suspension can compress a little more and let the front of the chassis bottom out now. Thanks for the input, Shen! Since I saw your awesome SuperShot...it really "shot" me to buy one!....most probably I'll get one after the re-re of the Wild One!....sigh! just wish money could grow on trees ! thanks for the advice.i was goin to get the tamiya GT or BZ as i dont wont to change my ESC. thats good that you have both used the same pinion so we can get a true speed test. Nothing like a real world test though. Hi the stock tamiya esc that comes with the new kits runs the 20 turn duratrax motor easy... i heard of guy's running a 9 turn in a lunch box with the stock esc!! Tamiya under rates the esc it's consistant farward amp rating is higher than other esc's that can go down to low turn motors...example the traxxas stampede esc compair specs then ask yourself why the traxxas one can go way lower turns on the motors when it's not better..tamiya just want's to be very safe i run the 20 turn motors with no problems. Tamiya rate the ESC at stall current, not running/nominal current. A silvercan 27 turn RS540SH Mabuchi will draw 57Amps at stall (9.5Amps at best efficiency). The TEU101/104 ESC is 60Amp and hence rated for 27 turn motors. 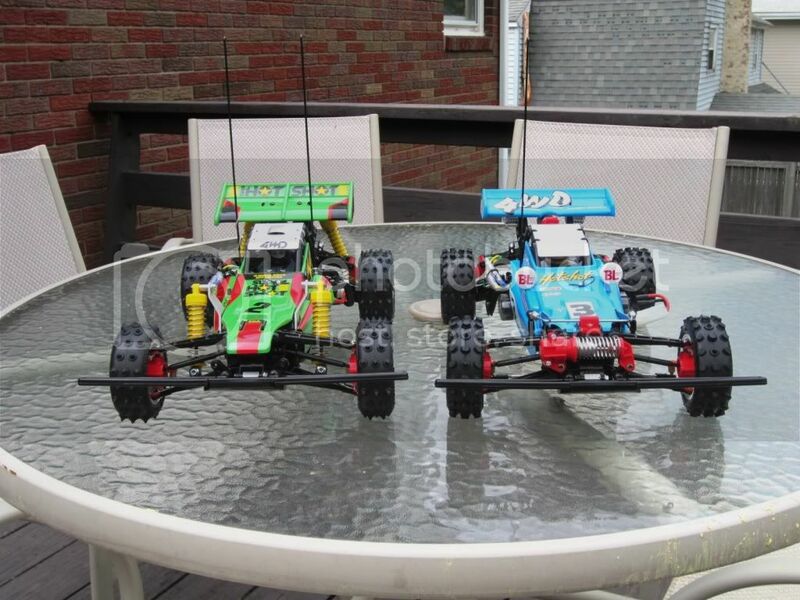 It's not that Tamiya under rate their ESCs, it's more like other companies over rate their ESCs. When you see a company claiming their ESC is rated for 20 turn motors, but is only 50 Amps, there's something up with the equation. Hi thats not true tamiyas esc is rated 60 amps continous farward current if the ESC is rated for continous farward current at 60Amps then its safe with a 27 turn motor because if a esc is rated 60 amps continous the peak amps is way higher for bursts like starting up full speed from a stand still with your car so the 57 amps at stall you are speaking off is nothing...i tested the amps that cars draw while running they never draw 57 amps when running in grass even...i have brushless systems i tested with my watt meter they only peaked at 30 amps a hair more and that s a brushless 3300KV motor and that's a recorded peak current normally most of the time it probably is running under 20 amps. I bet if i put my watt meter on my super shot with the 25 turn they give you in it it probably will be 20 amps a hair more if i set my watt merter to save the highest peak current that was produced by the motor. Test the current draw at stall, not under load. The 57 Amps that I quoted is from the Mabuchi spec sheet on the RS540SH. Rated as such to cover the lowest common denominator, say a 5 year old who might try to power the motor while preventing the wheels from spinning. You and I wouldn't do it, but a child might. I know I've seen my kids do it with powered toys when they were younger. Rating the spec of the ESC above stall current draw dramatically reduces warranty returns, ie: you void your warranty if you fit a motor of lower turn than tamiya specify, even though the ESC will still power it. Under 'normal' running conditions, and 'normal' usage, the Tamiya basic ESCs will happily power motors as low as 20 turn like the other manufacturers of 60Amp ESCs claim. They will not however live very long if you do as the 5 year old I previously mentioned does and prevent the wheels from turning while powering on. The TEU101 is 100% power both forward and brake/reverse. The TEU104 is 100% forward, 50% reverse/brake power like you say. Otherwise the two are the same spec besides the LiFE 5.0v cuttoff in the TEU104. One more thing to note. If you're using Ni-MH or Ni-Cd cell then the pack cannot supply 60Amps to the ESC even if the current draw from the motor is higher. Discharge rates of Ni-MH/Ni-Cd cells are not very high compared to modern Lithium based cells.